There's really not the problem of "jet lag" when you travel from India only as far as Singapore. 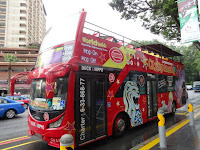 However, there is the fact that the clocks in Singapore are two-and-a-half hours ahead of our Hyderabad time-zone, so it's really easy to sleep-in and lose half of your sightseeing day. Another plus to booking a trip with a professional travel agent...with their help, you have a set-time when your tour-guide shows up at the hotel, so you get up, have breakfast, and get ready to go! But we were "on our own" this trip...and my Amy being a real "power sleeper" when she's worn-down from her work schedule and has the time to really sleep in. Add this to the fact that it was raining pretty good the morning of our second-day (Saturday) - it might have taken a fire-alarm to get her up and going. I left Sleeping Beauty in the big poofy bed in our room at the St. Regis Hotel, and made my way down the stairs to the buffet in the restaurant. By the way, we were on the thirteenth-floor! Room #1311. I don't think I've ever actually seen a thirteenth-floor in any hotel... much less stayed in a room on one! The restaurant was packed!! No room and a long wait for a table. But they told me that they open a second restaurant annex on the second-floor on weekends, so - I could go up there if I wanted. I asked if it was the same buffet, and they assured me that it was. Well...I went up to the second-floor and even that restaurant was packed full of people! They said that there was a table outside (where it was hot, humid and raining!) under an awning by the pool. I took the table...and it was a good thing I did...a line began to form as soon as I took my seat. The buffet was "just O.K." - and there's no way the second-floor version was the same as the main restaurant...for one thing, it was half-the-size! The coffee was decent, so I ordered some from room-service and carried a couple of fresh croissants up to the room for Amy. Yeah...she was still sound asleep. The coffee got her going and we decided to grab the umbrellas and head out for a day of seeing Singapore on the "Duck and Hippo" hop-on/hop-off bus where I had arranged for tickets. It was soon that we should learn that all concierges as not created equal. We asked the guy at the desk downstairs where we needed to go to catch the double-decker red tour-bus...and he pointed directly across the street and said "right there at that bus-stop". The Duck and Hippo advertising said that a bus comes every 20-minutes, so - even if we missed one it shouldn't be that much of a wait. Right? Wrong. Although the earlier downpours had slowed to a soft, sticky drizzle...it was still pretty damp outside of the hotel. Taking initial photos was going to be impossible for a while until our camera, fresh from the air-conditioned hotel, caught up with the humidity out-of-doors. The lens kept fogging! Well...we waied twenty-minutes. Every kind of bus came...except the Duck and Hippo. Another twenty-minutes passed, and - still no big-red-bus. At the 50-minute mark, I had had enough. I said "This can't be right...let's walk over to Orchard and see if the buses run there..."
After starting over to the main drag...then coming back once to the original bus-stop - It was the right move. Not only did all of the tour buses stop at the Orchard stop - - there was a Starbucks right next to it!! AND - just like the cliche - a Starbucks across the street from the Starbucks!! We had some vanilla lattes and saw the Hippo bus come and go once...so we knew we were on the right track! We finally got on after an hour-and-a-half of waiting...and we were off! The first thing you notice about Singapore (other than the fact that it's not all that big!) is that there are two passions there... SHOPPING AND EATING! It's literally wall-to-wall-malls in the Orchard district...and in-between...restaurants and eating-establishments of all kinds and sizes! The upper-deck of the Hippo was the perfect place to soak it all in...the rain had virtually stopped and the breeze up-top was pretty nice... The city is so very clean... And there's any sort of store you can imagine..electronics, cameras, clothing, antiques... if you have money to burn...a real shoppers paradise! We took the bus to the end of the line so that we could replace our e-mail print-out for real bus tickets...and - replace our tickets that we had purchased for the Night Safari at the Singapore Zoo from the night before. Again..something that would have never happened on a professionally-booked tour...we had forgotten that we had tickets, thinking that they were for Saturday! Amy told them that "our plane was delayed yesterday" - a pretty convincing little white lie that got our tickets moved... With our tour-package came a trolley-tour with a live Singaporean guide... but we had some time to kill. Since Amy had not eaten, we found our way upstairs to the food-court in the mall we were in and found a Vietnamese place that had fresh salad-spring-rolls and pretty decent chicken pho - the owner was cool - - he was wearing an NHL hockey t-shirt, he was ethnically Vietnamese, but was Canadian by birth...and lived in Singapore by choice. Sort of a microcosm of the whole place in one man!